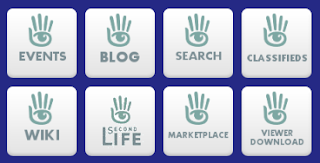 For those of us who store a lot of bookmarks from both official Second Life websites as well as residents' blogs, one of the best ways to manage all that content is by using Symbaloo. Symbaloo is a start page that simplifies managing bookmarks by allowing its users to create a visual icon ('tile') for each bookmark. Symbaloo is therefore a very convenient and easy way to keep track of all your Second Life content, rather than the conventional method of searching through a list of standard bookmarks stored in your browser. Since Symbaloo stores all of your bookmarks 'in the cloud' this means you won't lose any of your Second Life bookmarks, and you'll be able to access them from anywhere including on all of your devices. Once you've created a page ('webmix') of tiles you can also share them with the wider Second Life community. 1/ Click the '+' sign at the top of the Symbaloo page and the window pictured above will open. 2/ Give it a name and click 'Add' and your webmix is ready to add tiles to. 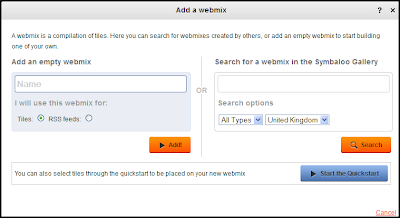 As you can see there are other options to begin your webmix, such as using the quick start option. 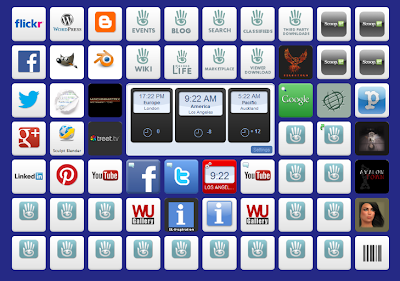 This will allow you to add existing tiles created by Symbaloo to your page rather than starting with an empty webmix. Once you have a webmix page and named it, adding tiles is easy. 1/ Hover your curor over an empty cell and click it. 2/ A side window will open (see image above). 3/ Paste a url in the space provided and name it in the space below the url. 4/ The window may then automatically select an appropriate icon for you. You can choose to use that icon, select another, or upload your own image. If you use your own image a small one is best (around 100 X 100 pixels). 5/ When you have finished click 'Save' and your tile will be added to your webmix. The Second Life Webmix is a selection of urls and SLurls I have collected that are not only useful to me but possibly to a number of other residents (click the image above to go to the webmix page). Three clocks that can be set for different time zones (very useful for Second Life). A compacted version of your Facebook page and Twitter feed. Your YouTube page can also be displayed here in a compressed form. Any RSS feeds added to the webmix will also be displayed here. These websites can also be viewed in a new tab in your browser by clicking the appropriate tile. Other popular websites used by creators within Second Life such as Gimp and Blender are also included. Bloggers can also quickly access their accounts through the Wordpress or Blogger dashboard tile. There are also a number of the most popular residents created websites (including of course SL-Inspiration and its sister blog, WU-Gallery). These are sites that are generally the most informative whilst others contain very useful tutorials. The other tiles are mostly taken up with some of the most popular and useful SLurls, including sandboxes, and some of the more popular clubs and art galleries. Hovering your cursor over each tile will display the name of the SLurl. Once the Second Life webmix has been added to your Symbaloo start page (click on the image above to get it), you can of course use it as your homepage. However, as not everyone will want to do this there is another way to create quick access to it, rather than searching through a list of bookmarks. 1/ Open the Symbaloo page in your browser. 3/ Copy the Symbaloo icon image above to your PC. 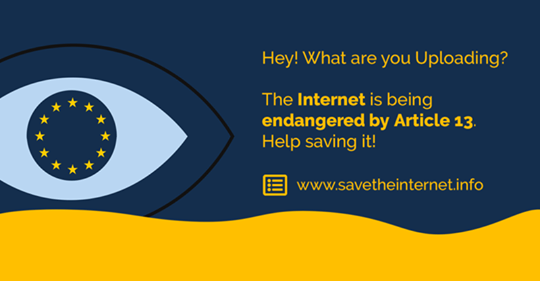 6/ Browse to where you saved the image above and select it. Now you can instantly access all your Second Life web content as well as your favourite SLurls, which means you can enter Second Life at the place of your choosing and not necassarily your home or last location. Using Symbaloo as a Second Life start page can be a very useful tool. 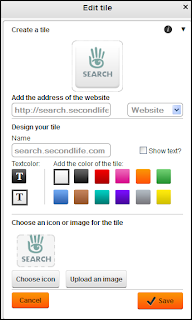 Try out the page I created, and if you like it you can create and share your own Second Life webmixes on Symbaloo.